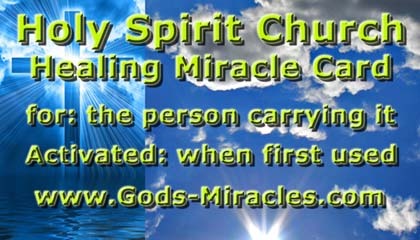 We are God's Church of Miracles and Healing !!! and this way you are helping them in strengthening their faith! For this purpose, You can get your Permanent Miracle Card NOW !!! Yes !!! We are expanding and, following that which the scripture tells us, you too can help us spreading the Word of God to the many "doubting Thomases" in the world, and to be a missionary of miracles certainly is a great opportunity for you: You can preach online if you like to do so, and this also is a great opportunity for you to achieve full financial independence as a Miracle Missionary! Want God-Blessed Water to make a Miracle happen? You can get it NOW !!! Click Here and you will receive Your Miracle Card in a matter of minutes! And it is absolutely FREE for as long as you spread the Word !!! Before I am telling you more about this exciting opportunity for you and an invitation to your action of true faith to join our missionary activity, I feel that I need to tell you how God has helped me and still is helping me, so that I can show you how God can help you and all persons whom you are helping with their Faith, to strengthen their Faith or actually to become Christians - joining a Church of their choice in their area, which they consider best for them: an action, which is the best for their personality, and the best for all persons, who are not Christians yet, and whom you can persuade to embrace the Christian Faith by providing them with the evidence of miracles, as is written in the scriptures! My name is Bishop Chris Church and, since my teenage years, I was dedicated to spread the Word, and I felt compelled to do so, because many times God has helped me in very difficult situations. Realizing that in our days the Christian faith is under severe attacks from many sides, I asked God what I should do to best serve Him, and therefore I went to the mountain that God showed me and there I went into hermitage for 40 days, where I prayed and fasted, and my faith in God was rewarded a thousand fold, and God showed me the path to take and He told me what to do, and this was the beginning of Holy Spirit Charismatic Church, which is God's Church of Miracles and Healing! And God told me to spread the Word as Jesus did, and Jesus did spread the Word by providing proof to the folks who listened, and He did so with Miracles, with Healing and with blessed Food and Water, and so did those who have spread the Word after Jesus: His apostels and those who followed in the footsteps of His apostels. Our missionaries - and You certainly can be One of them (hopefully! )- can spread the Word as Jesus did and those who continued His work, and like the missionaries of the past, the missionaries of the present too (and, as I said, you too can be one of them !!!) can do so by providing proof of the truth of God's Word with Miracles, with Healing and - more immediately - with allowing the "doubting Thomases" taste and feel the Power of Miracle Water, and the difference in taste is just amazing - and very convincing! And it works on so many people, believers and non-believers, that the "placebo effect" excuse is more than ridiculous! You will find out this when helping others! In fact, as long as you practice as a missionary, you will have a fully activated Miracle Card (no money required - of course we welcome any donations, which provide us with more power to spread the word more effectively) - and even before miracles happen, the miracle of the difference in taste of the water will be proof for those who have faith and who are worthy and willing to experience their miracles. All it takes to keep the card active is to have other persons get their own card! The power of the card is extended one month for each person whom you help getting his/her own miracle card! In fact, for every person whom you invite and who then in turn asks for a Miracle Card, your Miracle Card will remain activated for another month! The cards are for FREE - as with yours, people just ask for it and print it out, or you ask for it in their place, click here, print it out when you get it and hand it to them !!! And, as was the case since the earliest times of Christianity, there can be even more rewards for missionaries like you, if you want it: rewards, which eventually will ensure that very active missionaries can continue their work feeling secure in many ways, including financially, and this is based on their performance in spreading the Word, without them needing to worry ever again about what tomorrow will bring. And on the mountain God told me to tell you again what Jesus told already long ago, and which you find in the scriptures: that you can make miracles happen, provided that you have faith, and, as you know, it is extremely easy to have faith: all it takes is to open your mind and to open your heart and to open your soul to God, and this will even be easier whenever, with God's help, you can make your own Holy Water of Miracles and Healing and experience its benefits, and this, your reaction to your direct experience of the Power of God, will be a similar one as were the responses of all the people, whom Jesus and later His apostels provided with the evidence of the power of God, which He did by helping them with miracles and with healing and with Miracle Water. Considering the huge potential of the information highway, the internet, God told me to spread His Word by means of this powerful tool of information and to make it easy for others to spread His Word by providing them with the Miracle Cards, or Credit Cards of their Faith in God, and this is a very powerful tool of faith befitting our times, which will remind you of the Power of God whenever you use it and which also will provide persons whom you help with the evidence of His Power just as Jesus and His apostles provided this evidence to the people of their times by adjusting to the methods, which were used back then during these times. Most importantly, the internet makes it much easier for anybody on this planet to join church services. You find a time table of church services on this site! Therefore the Miracle Cards are the tools of our times for the children of God of our times, and these exciting tools are speaking the language of our times, as Credit Cards of Faith, therefore making it easier for God's children of our times to understand the Power of God and the Language of Faith. 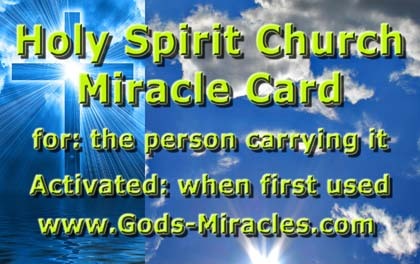 Like a credit card, you can carry the Miracle Card in your wallet and help others with the Holy Water of Miracles and Healing and, above all, with this Miracle Card you can provide them with the proof of the Power of God, whenever the opportunity arises and whenever you see a need to do so, and you can tell them that they too can receive their Miracle Card, which will be active for two weeks at first and then it will stay activated for an additional month for every new person whom they invite and who then will ask for his or her Miracle Card !!! And, as was the case with the apostles, who were the first missionaries of the New Testament, there is still much more in it for you !!! Whenever you receive your permanent Miracle Card, all of us invite you to spread the Word as the Word was spread to you, and to show others the evidence of the Power of God with the help of your Miracle Card and to lead others on the path of becoming missionaries of God, and as a missionary of God you will receive generous parts of the tithing given for the Miracle Cards as a reward, which tithes will make it much easier for you to follow in the footsteps of the Apostles, as a true missionary of God, convincing people to get back to their Christian Churches or to join our church, whichever Christian Church they prefer, whichever Christian Church fits best their personality. Most imporatnly: Whenever an adequately large group of people will have found back to being true Christians as a result of your missionary work and miracles, plus the missionary work of persons whom you invited to join in on this very important manifestation of faith, you will have the opportunity to become a preacher of our church, online and/or out of your home or out of a dedicated church building, and then you can receive the still more powerful Healing Card, and we will provide you with the opportunity to preach the Word of God online over live streaming video, whenever you feel the calling to do so, and eventually God can bless you by providing you with the power of healing by laying on your hands and to heal and perform miracle blessings, financial help and many other miracles at a distance. A life, which is better and happier than before, because it is a life, for which God had created the world. You too deserve this way of life !!! This is a reward for faith and for spreading the Word !!! a Missionary of the Christian Faith !!! Again: We are expanding, and this can be a great opportunity for you to be a missionary of miracles, including an opportunity to preach online! Want a Healing Miracle Card? To provide others with miracle healing power to help them emotionally and/or physically? Simply make a donation and we are going to send you one!